After the family photos are done and the guests depart the ceremony area for the pre-reception cocktail party, it's time for the couple to share a few sweet moments as a newly married team. For this portrait at Pelican Hill Resort in Newport Coast, I asked the couple to just enjoy each other. The groom gave me just what I was hoping for when I asked him to kiss his bride's forehead. When photographing a sweet moment, it helps if you can direct your couple to close their eyes so the image transports you to a place that shows true emotion and affection. If the bride or groom had left their eyes open, the image would not be as soft or emotional, as it would look staged and posed, and the couple would look uncomfortable. Location: Pelican Hill, Newport Coast, CA. 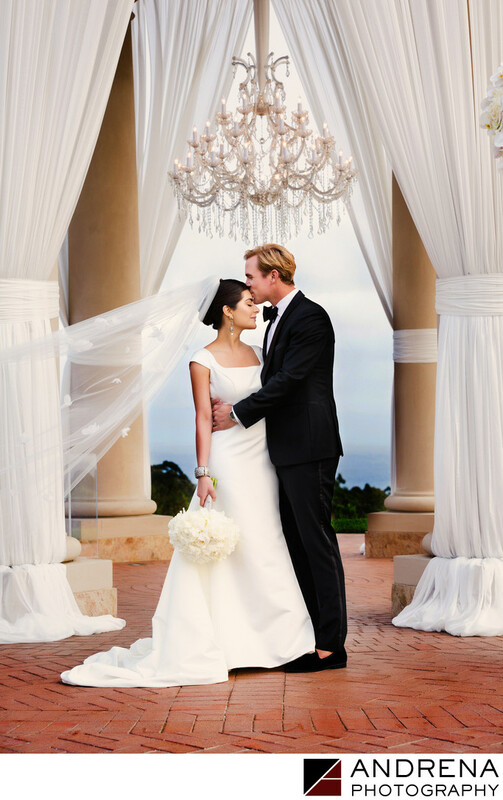 Keywords: Bride and Groom Photos (3), Los Angeles Wedding Photographer (18), Pelican Hill Wedding (6).